SKK Mobile may be a new player in the local mobile scene but it has a lot of guns under its roof. Their latest smartphone, SKK Mobile Marian S1 is an Octa-core powerhouse loaded with bucket-full of features and gutsy hardware. And yes, it has been named from one of the most popular star in the country – Marian Rivera. Aside from the Octa-core processor, what does this phone has in store for us? On paper the CPU is clocked in 1.7-gigahertz MediaTek MT6592 processor. It is also backed up with a Mali-450 GPU and a gigabyte of RAM. The 5-inch HD IPS display would deliver crisp and vivid pictures on your screen that frames a 294ppi pixel density. Memory-wise, the Marian S1 will have 8-gigabyte of built-in memory which is expandable up to 32GB via microSD. For mobile photographers, the SKK Marian S1 will give you a hefty 13-megapixel rear camera sensor with autofocus and LED flash. You can also take selfie shots with its 5-megapixel front camera. It’ll have one of the latest software versions of Android, v 4.4.2 KitKat. The Marian S1 will also have a dual-SIM capability plus a whole set of radios (WiFi, GPS, Bluetooth, etc) under the hood. This 7.7-mm candybar phone will have a 1900 mAh and a spare 2400 mAh battery out of the box. 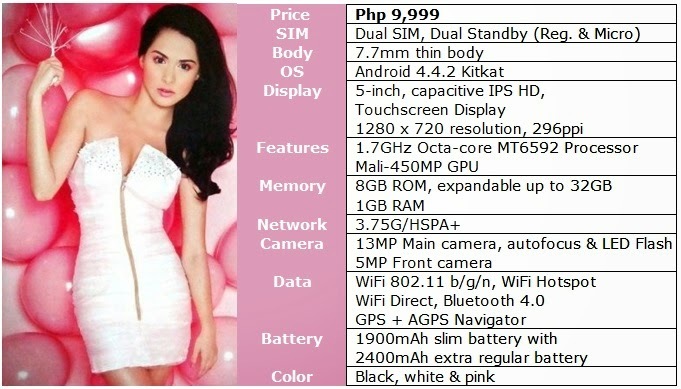 The SKK Mobile Marian S1 is retaied at Php 9,999 at any SKK kiosks and outlets across the country. You’ll also get a smart case and a whole set of Marian Rivera exclusive photos and videos.